The cities of Quequén and Necochea constitute an urban conglomerate of about 86.000 inhabitants divided by the Quequén Grande river. There is an intense commercial activity as the city is in the middle of one of the richest farming areas in the country. There are also important agro-industrial plants (vegetable oil and seeds by-products) and fish processing plants. Also, there is a médium-sized agriculture equipment industry. The area has good road access and is connected by highways Nº 55, 86, 88, 227 and 228. The city is served by the Ferrosur Roca railway and there is a small airport for medium sized airplanes working domestic routes. 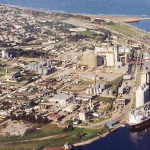 The port is situated at the mouth of the river Quequén, Necochea occupying the right bank and Quequén the left bank. In 2011, 283 ocean going vessels called. Trade consists mainly of exports of soybeans, wheat (mainly to Brazil), maize, sunflower seed pellets and vegetable oil. A total of 5,6 million ton of grain and agri by-products were exported in 2011. Shipments of wood chips have dropped due to the local wood¥chip plant is presently not operating. 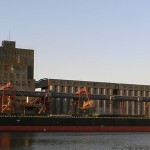 Imports are almost entirely confined to the reception of bulk. There is an anteport immediately inside the breakwaters and there are 13 berths along the riverfront (seven on the Quequén side and six on the Necochea). The least width in the anteport is approximately 500 m; anchoring is not allowed. On entering, and weather permitting, vessels are swung in the anteport to enable them to berth bow out ready for sailing. Should this not be possible vessels berth bow in with the need to be swung on completion of loading and the possibility of delay depending on weather conditions. The anteport is affected by some swell, as are all the berths in the port especially during southerly gales. The port has two protecting breakwaters, the northern breakwater measuring 572 m and the southern breakwater to 1594 m, providing protection from the southern swell. The entrance between breakwaters is 220 meters wide and the channel is dredged to average depth of 13,70 m (45 ft) (July 2012) in a width of 120 m. It is proposed in the near future to shorten the northern breakwater by 50 m.
North: by an imaginary line running parallel to coast. Distance 5 miles. East: by meridian 58º 21´W Pilot boards about 1,5 miles SE of southern breakwater. Anchoring is permitted within the zone delimited by the following limits; North: by an imaginary line parallel to the coast 5 miles off the coastline; South: by parallel 38º 46´ S; West: by meridian 058º 51´ W and East:by meridian 058º 28´ W. However the Coastguard may allow anchoring within the 5 mile limit in the case of having to embark/disembark crewmembers, etc. The PNA regularly broadcast gale warnings in Spanish. 1) Maximum permitted LOA to enter/leave port 230 m, basis channel width of 120 m. Should channel width be reduced for any reason then maximum permitted LOA is decreased by 10 m for every 5 m reduction. 2) Whilst there is no maximum stipulated draft at this port, the recommended maximum is 13,00 m (43 ft) and this is the maximum recorded draft to date. 3) Regarding draft/wave height: If wave height, measured on the outer part of the access channel, is equal or less than 0,50 m, all vessels sailing/entering must leave under the keel clearance (UKC) of 0,3 m (1 ft) if rising tide, or 0,6 m (2 ft) if ebbing tide. Additionally to this UKC, for LOA from 80 m to 230 m, ships sailing/entering must add a safety margin of 0,10 m per each 0,10 m of wave height exceeding 0,50 m, up to a wave height of 1,80 m. For wave height above 1,80 to 2,70 m the safety margin to be applied to the UKC depends on draft, beam and LOA, with different percentages related to ship´s draft for vessels entering, and other percentages for vessels sailing, providing the waves’ period is up to eight seconds for all cases. Agents must be specially consulted about these three safety margins. 4) Coastguard prevents ships from entering or leaving port if: a) wave height exceeds 2,40 m (ships up to 230 m LOA) or 2,70 m (ships up to 140 m LOA); b) wind velocity exceeds 37 km/h-20 knots; c) when visibility is less than (2) two nautical miles. 5) Crossing is not permitted in the access channel, nor are maneuvers inside the port when another vessel is entering/departing. 6) Vessels are normally required to berth bow out, however they are permitted to berth bow in if conditions do not permit vessels to be swung or if special cargo conditions so require. 7) For vessels entering/leaving trimmed by the stern, the unsighted distance forward of the bow shall not exceed 400 m.
8) For entering/sailing vessels may have a positive squat of not more than 2%. Additionally, masters are warned that a high tension electrical cable is strung above the river between berths 6 and 8. Height is 40 m (131 ft) at datum. A system for wave height and direction recording is in service, located at Lat 38º 35’37,2´´S , Long 58º 41′ 20,4″W , depth of 14 m (46 ft) at 630 m from south breakwater, not interfering with traffic. Agents should notify Consorcio de Gestión del Puerto de Quequén (Port Administration) harbor master and grain elevator / shippers at least two working days beforehand of vessel´s ETA with confirmation holds ready. It should be noted that vessels loading vegetable oil have priority at berth 1 and any other vessel requesting this berth, in theory, must be prepared to accept vegetable oil loaders second off if need be. Regulations state combined beams both vessels plus fenders must not exceed 50 m. However, usual practice dictates that the vessel on the berth is requested to work a minimum of 18 hours per day to ensure prompt termination and freeing of the berth. Radio communications 24 hours a day via Argentina Radio. Quequén Prefectura Naval Radio, L5B and VHF Ch# 12-14-16. Also VHF for Pilots and launches. Compulsory. Pilots offer their services individually or in association with others. Pilots board about 1,5 miles SE of southern breakwater head. granted only alongside, not at anchor. 1) Vessels up to LOA 80 m – no tugs required. 2) Vessels of LOA over 80 m up to 100 m – one tug required. 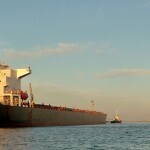 3) Vessels of LOA up to 140 m berthed bow out can sail with one tug except from berths 7, 8, 9 and 10. (With special coastguard permission). 4) Vessels of LOA up to 160 m with bow thruster of adequate HP and immersion can enter/sail with one tug except to/from berths 7, 8, 9 and 10. (With special coastguard permission). A tolerance of 5% on the above figures is normally granted by PNA. Two towing companies operate with two tugs each, all of about 3500 HP. Available at 2 private Clinics and 1 Hospital at Necochea and 1 Hospital at Quequén. As Necochea is also a holiday resort a wide variety of hotels is available, mostly during Summer season. Connected by road to highways 86, 88, 227 and 228. Regular bus services to other cities. Railway connection to Buenos Aires. Local airport for light aircraft/small commercial planes. Bunkers usually provided from Buenos Aires, Mar del Plata or Bahía Blanca via road tankers. However, MGO can be supplied from Necochea. Ample pre advise and careful checking required to avoid charges for trucks standing by. Brackish water, depending on tide and rate of river flow. Varies at different berths and convenient to check prior completion loading. Usually between 1015/1018 and 1020/1023 for low and high tides respectively. Available from pier by hydrant. Delivery rate about 6 TPH. Available at pier, mono or tree-phase. Compulsory for foreign flag vessels of more than 2000 GRT except those accorded special treatment as Argentine flag vessels. Can be withdrawn by truck with appropriate Custom permit. Local naval workshops available for deck, electrical and engine repairs, usually in connection with Buenos Aires workshops when exceeding local possibilities. As no workshops available for repairing radio/electronic equipment, same must be sent to Buenos Aires, Bahía Blanca or Mar del Plata. Private firms own and rent several mobile cranes ranging from 6,5 ton/ 7 m up to 35 ton/25 m SWL/outreach. 8 portable mobile gangways available for rent. Service available for inflatable rafts, fire extinguisher or CO2 refills. Tank trucks can be arranged from Buenos Aires, and should be requested in good time. Victuals are normally supplied by local ship chandlers, who also work jointly with Buenos Aires firms. 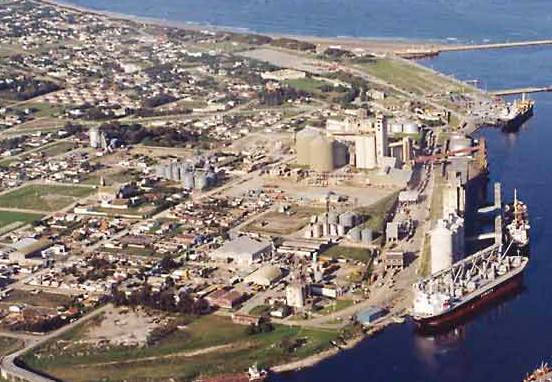 2 Port Administration depots at Necochea with a total of 3000 sqm/ 5000 ton bagged grain capacity. Private depots are also available. Open storage yards at Necochea berths 7 and 8 and on Quequén side berth # 1 available in case of need.